On an excursion to show some wealthy Japanese tourists some of the submerged sites of his home city, Carlos Tafur finds himself unexpectedly affronted by their plan to relocate a fine mosaic of the Madonna to their country. Impetuously, he abandons his charges; as if in punishment, on his way home his boat is caught up in a terrible storm that forces him to seek shelter in a lonely tower, which turns out to be occupied by an old woman possessed by an apocalyptic vision. But in the morning, when the storm has passed, the world seems new. Carlos reconciles himself to the fate of his city, and sets out to pick up the businessmen. No paragraph in The Best of Kim Stanley Robinson demonstrates better than this one how effectively Robinson can convey the physicality of life. The sentences that echo the rhythm of the physical world ("His boat rose and fell, rose and fell"); the fatalistic acceptance of circumstance ("it would sink or it wouldn't"); the amusement and delight at an unexpected feat ("He had done it perfectly! "); and the involuntary, celebratory exclamations ("Wow!"). Few other writers can capture so vividly the sense of being-in-the-world. The twenty-two stories collected here are arranged by Jonathan Strahan in not-quite-chronological order, so perhaps the temptation to give the book a splashy, award winning opening was never there, but "Venice Drowned" seems so neatly embryonic—its narrative a little compressed, its characterization a little abbreviated, but tonally and thematically of a piece with later work, with a familiar warmth to its imaginative universe—that it could have been chosen to reassure. 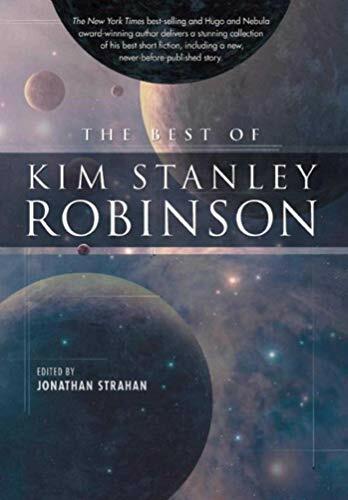 Readers looking at this modest-but-not-slim volume, aware that titles are code, and that "The Best of Kim Stanley Robinson" means "The Best Short Fiction of Kim Stanley Robinson", might need a little reassurance. Any account of Robinson's career tends to be primarily structured by the trilogies, the Californias and Marses and Numbers; and the most characteristic moments in each of them tend to be powered by an accumulated weight of story, to gain strength from the breadth of their context and vision. To look elsewhere for "the best" seems almost perverse; surely the best is in the big works, not in here. But "Venice Drowned" demonstrates that Robinson is able to work on a small canvas. It's something of a preparatory sketch, yes, but it's still a work that rewards attention thirty years later, and a good overture. It's also a little misleading, because the cluster of stories that, like "Venice Drowned", foreground an engagement with the natural world is relatively small. And some are surprisingly minor. "Ridge Running" (1984) may have been a Hugo nominee, but its present tense narration and distanced perspective conspire to ensure that there's little sense of a connection with its mountaineering protagonists; and a sudden lurch into science fiction via a dialogue on the philosophy of language feels clumsy and out of place. Moreover, everything good that it does is accomplished more fully by "Muir on Shasta" (1990), a reimagining of the experience described by John Muir in "Snow-Storm on Mount Shasta" (1877) that stays clear of superfluous SF to get at the experience of extremis that clearly interests Robinson most in both stories. A disagreement between Muir and his climbing partner leaves the pair stranded in a storm halfway up one of the highest peaks in the Cascades. They survive by huddling around fumaroles, alternately baking and freezing, with Muir retreating into a hypnotic, transcendental reverie, becoming one of Robinson's most intense witnesses to the world. In other stories, extremity seeks out the protagonists. In "Glacier" (1988), a new ice age has brought the titular feature to downtown Boston. A more domestic tale than the others I've discussed so far, the story's protagonist is the teenaged son of a Canadian academic, whose family has been progressively pushed south by the shifting climate. (The hint of fantasy in the speed of this scenario is not so surprising in the context of some of the other stories in the collection.) His life alternates between periods of superficial normality—lively banter between bright minds—and desperation at the seeming inevitability of their onward migration. Yet the glacier itself is as much solace to Alex as threat: a place he can go to feel calm. What's missing, however, are the Mars stories that explore similar themes. The absence of "Green Mars" (1985) is a disappointment but perhaps not a surprise, given the story's length; the absence of "Exploring Fossil Canyon" (1982) is both disappointment and surprise, since its emphasis on the experience of the Martian landscape as Martian is one of Robinson's key themes, and otherwise absent. (Plus it would have been nice to have at least one story in the collection with a female protagonist, just for a change of pace.) To be clear the two Mars stories that we do get are two of the best stories in the book. "Sexual Dimorphism" (1999), a Tiptree honoree, is a potent evocation of a collapsing relationship, and of the wild energy of sexual attraction: perhaps the most emotionally wrenching story here. Diametrically opposed is "Arthur Sternbach Brings the Curveball to Mars" (1999), which I can only assume Strahan moved to its position early in the running order to lighten the mood after several tough tales. If that was the strategy, it works; the story is a delight, even for someone who's never seen a baseball game and avoids most physical exertion. A perfectly shaped yarn in a which an American immigrant to Mars finds himself coaching a gawky Martian teen, the story is dotted with both moments of sheer physical joy, and lovely situation humor. But the role of Mars in the tale is primarily to focus and intensify: "What I'm telling you," Sternbach notes after an explanation of the closeness of Martian horizons, "is that the baseball diamond covered the entire visible world . It was so great" (p. 110). Mars as place, the extraordinary landscape of the novels, is notable by its absence. In fact, the most sustained and overt environmental writing is to be found in "Escape From Kathmandu" (1986). Another Hugo nominee, and another yarn, it's the first of a series of four stories (the others not included here) chronicling the unlikely adventures of two American expats living in Nepal. George Ferguson—George—is unable to resist his curiosity at an unopened letter lingering in the mail rack of his hotel, and finds himself drawn into the orbit of George Fredericks—Freds—and his friend Nathan, who is distraught at the role he's played in the capture of a live yeti. Pretty soon the three have concocted a scheme to re-wild the yeti before it can be transported to America. Screwball antics ensue, as our heroes attempt to smuggle a disguised yeti past not only its original captors and the citizens of Kathmandu, but President Carter and his Secret Service detail. Reading "Escape From Kathmandu" in 2011, it's clear that the story is fundamentally what Patrick Hudson has recently identified as "gap year SF": Western characters having adventures against an "exotic" background. For all the honest concern about the fate of the yeti, this tale is a foreigner's love letter to Nepal, in which the locals exist only to facilitate the adventure. But if you can forgive it that flaw, there are pleasures to be found: vibrant personality, both George's laconic narration and Freds's ridiculously over the top enthusiasm for their mission (and everything else); one of Robinson's most straightforwardly engaging narratives (it would, with a bit of careful updating, transfer well to film, one of the few stories here you can say that about); some vivid descriptions of mountain ecology; and finally a transparent seriousness to its characters' desire to tread lightly. George and Freds may be thoughtless in their tourism, but they're decent in their motivation; and while their story is lightweight, it's heartfelt. A larger cluster of stories has to do with—directly or indirectly—the construction of history. Two in particular set the tone here, by explicitly inviting consideration of what history is, and where it stands compared to, say, fiction. In "Remaking History" (1988), a troupe of actors are making a film about the events of the 1979-1981 Iranian hostage crisis, and arguing about the need for historical accuracy in what they're doing. Their director has sold them on the notion that they can provide a corrective to an earlier "dumb TV docudrama", yet insists that "when making a film, true doesn't mean an absolute fidelity to the real" (p. 211). As the story unfolds, it becomes clear that—inevitably—the history they're arguing about altering is already alternate to our own, a timeline in which the hostages were rescued, and Carter was re-elected, and history bends towards where they are now, with a colony on the moon. Gradually they close in on a version of the great men versus historical circumstance debate; the story ends with an event that can pointedly be interpreted as supporting either model. The director's position is more forcefully articulated in "Vinland the Dream" (1991), an even more schematic tale which imagines that the story of Vinland is an extraordinary hoax. "History is made of stories people tell. And fictions, dreams, hoaxes—they also are made of stories people tell", one character insists, sweeping aside another's objection that it surely matters that some things really happened. "We judge all the stories from history like that—we value them according to how much they spur our imagination" (p. 299). By that token, there is more shared between, say, the World Fantasy Award winning "Black Air" (1983) and the Hugo-nominated "The Lucky Strike" (1984) than you might at first think. (The stories are handily set next to each other early in the book, allowing their similarities to emerge before the argumentative stories above impose meaning on them, a charity I have now entirely undone.) The former story describes the experiences of a young boy aboard the Spanish Armada; the latter describes the experience of the man given the responsibility of dropping the first atomic bomb on Hiroshima. One turns into alternate history, the other, somewhat unexpectedly, becomes a hallucinatory historical fantasy. Manuel, the slave at the center of "Black Air", can see souls as dancing flames above his crewmates' heads, and see them snuffed out in death; he becomes a token to the crew, and brings their situation vividly to life for us, but he has no power to change anything, however hard he prays and tries. His is a tale of entrapment within history's jaws. So we might expect horror, heading into "The Lucky Strike", in which Captain Frank January finds himself the bombardier on the titular aircraft, flying towards Hiroshima, after an accident takes the Enola Gay out of action: but he does change things. January is slightly too easy a character for liberal readers to sympathise with—being an older man, a conscientious man, a cultivated man, a man who looks at his fellow soldiers and sees "young toughs, capable and thoughtless . . having a good time, an adventure" (p. 83)—and pretty soon there's not much doubt that he won't go through with it. But Robinson captures his inner turmoil with clarity and intensity, until we are able to believe that "a person [is] a bomb that could blow up the world" (p. 85). So both stories are tools to explore a human consciousness, and the potential for agency, at a key point in our consensus historical narrative; but they come to different conclusions. When Pauli's exclusion principle, which states that two particles cannot occupy the same position at the same velocity within the mathematical limits of the uncertainty principle, is applied to the sum over histories, it indicates that some possible paths cause interference patterns, and cancel each other out; other paths are phased in a reinforcing way, which makes their occurrence more probable. In Galileo's Dream , when the maestro is whisked away to the year 3,000 and given a history lesson, this is pretty much what he's shown: a great river of histories, many streams braided together to carve a limited channel through possibility space. Whether or not this is a sustainable model for understanding history, it strikes me that it's a fascinating way of understanding science fiction's versions of history—indeed, as John Clute argued in setting out the concept of "First SF", the existence of an early default narrative for the genre, it was the compelling understanding of the field as late as the early 1990s. Since then, we are meant to understand that there is no consensus history of the future in the way that the Moon-Mars-Stars progression provided a backdrop for the Golden Age. And yet the version of our future that Galileo is shown passes through a wrecked world, a rebuilding with an increased understanding of environmental stewardship, a slow exploration of the solar system. It's impressive, when you stop to look at it, how much contemporary SF falls somewhere on this timeline—Paolo Bacigalupi's The Windup Girl (2009) at its nearest end, Paul McAuley's The Quiet War (2008) at the other, Ken MacLeod's Fall Revolution quartet (1995-1999) covering the whole spread. As a template narrative, its only real contemporary competition is the Singularity. What this vision of history and SF amounts to is a recognition that to shift that great river in its course is really hard, but necessary: a recognition that history lies heavy on the soul, but must be borne. It's a stance that shapes two of the non-SF stories in this collection; indeed I'd argue, given the above, that it's a stance that makes them feel at home in an SF collection, or at least in this one. In "A History of the 20th Century, With Illustrations" (1991), Frank Churchill (it's always Frank, in Robinson; there is a sum over Franks to be imagined), a historian struggling with depression, is commissioned (in what could technically be the story's near future, but which has no noticeable SFnal changes) to write the titular coffee table book. Numbed by the progression of carnage he is forced to recount—from world war to total war to what he labels atrocity war—he sets out on a journey across the UK, unable to escape the sense that the world around him is only memorial, or to come to terms with the conclusion of a predecessor, who wrote an equivalent work a century earlier: "I believe that Man is good. I believe that we stand at the dawn of a century that will be more peaceful and prosperous than any in history" (p. 313). On the farthest shore, he despairs; and in his despair reconciles himself to optimism as the only way to preserve sanity in the face of horror. And then there's the collection's original story, "The Timpanist of the Berlin Philharmonic, 1942" (2010), which is in no way fantastical but which inhabits Beethoven's Ninth Symphony, as performed for Hitler's birthday, as a landscape as palpable as any Robinson has written. "They were all doomed" (p. 385), and they all know it; and they play knowing it. It's that commitment to life even in darkness that brings Robinson's characters alive: like Carlos, like Muir, like Freds, like Manuel, and like Frank January, and like Frank Churchill the timpanist lives hard: history be damned. There's much more in The Best of Kim Stanley Robinson than I've set out here; I've discussed less than two thirds of the stories so far, and naturally concentrated on those that spoke to me most clearly. Several of the others do seem to me minor work, even if they illuminate aspects of Robinson not much displayed elsewhere: "The Translator" (1990) is one of only a few of his works to tackle aliens, but its account of translation difficulties barely rises above the pedestrian; "Before I Wake" (1989) is a curious dreamlike tale that seems precisely unlike the sort of fantasy you might expect Robinson to do well, and meets that expectation. Others, most notably the Nebula-winning "The Blind Geometer" (1986), with its uneven mix of perceptual philosophy and conspiracy thriller, are ambitious but awkward. But there are gems that haven't fitted into my neat schema, too: "Zurich" (1990) is exactly the sort of fantasy you might expect Robinson to do well, and meets that expectation, being the most entertaining, joyous and heartbreaking story about cleaning and saying goodbye that I've ever encountered; and "The Lunatics" (1988) is a brilliantly claustrophobic tale of exploitation and conceptual breakthrough. All add something to the texture of the collection; and if the whole is not impressive enough to declare Robinson a master of the shortform, there's enough of his best here to establish the importance of his short fiction to any full picture of his career. The absence of "Green Mars", my personal favorite of all KSR's works (partly, but by no means entirely, for personal reasons), is indeed a shame, but in fact Jonathan did have "Green Mars" in his first (entirely speculative) TOC for the book (proposed on his blog, before it became any sort of reality). Excellent review on the whole, I should add. Your excerpt from "Venice Drowned" is very well chosen, and very characteristic of KSR. And I agree entirely about the weakness of a story like "The Translator". I will say that I think it ought to be trivial to "forgive" "gap year" SF (or "gap year" fiction period, silly to think it's confined to SF) -- what is wrong with Western viewpoints of other cultures, as long as it's clear that that is all it is: a Western viewpoint, not the whole truth. Surely it would be worse for a writer to assert he was writing from a local viewpoint and get it entirely wrong? And even his best novels (Red Mars (all the Mars books), The Years of Rice and Salt) are in essence collections of novellas. First I'd disagree with "in essence", there; structurally, yes, a good number of his books are a series of linked novellas, but the "linked" is what makes them novels rather than collections. What I mean is, very few of the novella-length sections in the Mars novels would stand well alone, and all but the first, I think, would lose power if you forced them to stand alone. Would "The Scientist as Hero" (assuming I'm remembering the title correctly) work as well alone? It would still be a fun portrait of a scientific conference; but you wouldn't get the same punch in the gut when Sax encounters the poster describing the miniscule contribution of his windmills to the terraforming effort. "On Mars, on Mars, on Mars ..." wouldn't mean as much at the end of 100 pages, rather than 1500. Secondly I'd include other novels in his best -- in particular Pacific Edge and Galileo's Dream -- and exclude The Years of Rice and Salt. And I have a lot of sympathy with the climate trilogy; in fact in that case I think its structural problem is that it's too drawn-out, I'd have preferred it as a single thousand-page novel, I think. Indeed. But as he himself might say, that doesn't stop the book that exists being the wrong book -- only a little bit the wrong book, perhaps but still! what is wrong with Western viewpoints of other cultures, as long as it's clear that that is all it is: a Western viewpoint, not the whole truth. Put like that, not so much; but in the case of a story like "Escape From Kathmandu", which is about preserving the local natural environment (as represented by the yeti), it's problematic not to hear from any local voices, I think. I can see where Rich is coming from in saying the longer works are comprised of novellas. I seem to remember there were sections of Red Mars at least published in Asimov's and certainly the portions I heard Robinson read from Blue Mars worked in relative isolation. Interesting that you picked up on the recurrence of Frank as a name in Robinson's work. I noted the use of Claiborne in Pacific Edge and the Mars works. Claiborne or Clay-born is obviously suggestive in the context of ecologicallyfocussed stories, but does Frank mean more too? Indeed, I recalled a few of the sections of Red Mars (and at least one, as I recall, from a later novel) were published isolated in Asimov's. Checking the ISFDB, however, I can only find one: "A Martian Childhood" (opening of Green Mars). Certainly they have a cumulative effect -- the novels are novels, even if they are also collections of novellas. But many of the novellas work excellently alone -- for example, my favorite section of the entire trilogy, "Falling Into History". I was thinking a bit about major SF writers who wrote lots and lots of novellas -- KSR, of course, and Wolfe, whom I've already mentioned. Damon Knight is another particularly good example, I think. Maybe Robert Silverberg. Kev: So how many Franks have we got? Frank Churchill and Frank January here; Frank Vanderwal in the climate books; Frank Chalmers on Mars; are there any in the Californias? Any others?